In the spring of 1978, a crowd of family and friends gathered at the Cable Cove boat ramp on the southern shore of Fontana Lake, and unloaded assorted covered dishes and brilliant floral arrangements from their cars. Since the 1940s, when Fontana Dam was built and the valley flooded, the lake’s northern shore had only been accessible by boat. Four small crafts manned by Great Smoky Mountains National Park rangers arrived that day to ferry the group across the lake, where more rangers waited with all-terrain vehicles to transport folks to Cable Cemetery. For many, who were displaced when the lake was created, it was a homecoming, and their first chance in years to pay respects to the relatives laid to rest on the north shore. These people had come to celebrate Decoration Day, a precursor to Memorial Day, and a decidedly Southern custom. 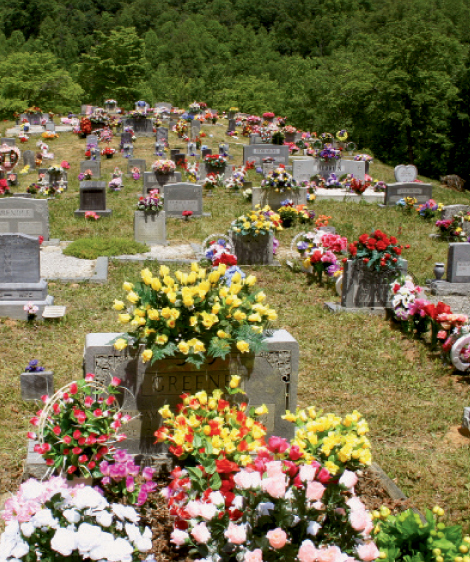 It can fall on any Sunday in May or June, and is a time when families and sometimes entire communities come together to honor the deceased by cleaning burial sites and decorating graves with elaborate sprays of flowers and tokens of affection. Afterward, a cheerful fellowship of singing, sermonizing, and storytelling breaks out, as well as an old-fashioned buffet-style picnic known in the mountains as “dinner on the ground.” Decoration Day is still held throughout the South, and the celebrations that take place in WNC are deeply rooted in Appalachian culture. It’s possible that Decoration Day came about through a blending of cultural antecedents brought to the mountain’s by early Scots-Irish settlers. One likely forerunner is the ancient Welsh and Scottish tradition called Flowering Sunday when, on Palm Sunday, graves were cleaned and decked with flowers. Another origin may be the mountain custom of funeralizing. In earlier times when someone died during the winter, inclement weather often postponed the burial until spring. The tradition carried on after Civil War, when Southern women’s groups decorated the graves of fallen Confederate soldiers. The practice was adopted by Northerners in 1868 when the wife of General John A. Logan, commanding general for the Grand Army of the Republic, was touched by the sight of flowers placed on Confederate graves in Richmond, Virginia. Logan issued an order instructing Union veterans to likewise decorate the graves of their fallen comrades. Not everyone welcomed the practice. At the time, a Philadelphia newspaper referred to it as an “inappropriate imitation of a Rebel custom.” Despite the initial unease, the observance evolved into today’s Memorial Day. While Decoration Day often coincides with Memorial Day, the two holidays are distinctly different. The latter honors the nation’s veterans, whereas Decoration Day remembers all of the deceased and every grave in a cemetery is adorned. “There is a powerful and oft-cited social rule: No grave should go undecorated,” wrote husband and wife folklorists, Alan Jabbour and Karen Singer Jabbour in their book, Decoration Day in the Mountains. This often brings such an abundance of flowers that burial grounds achieve “new heights of sumptuous creativity,” note the Jabbours. Other objects are also added, such as ornamental angels, deer, birds, and personal mementos specific to the deceased. Historically, Decoration Day came in May, and certainly part of the allure of the celebration was the emergence of spring after a long winter of isolation. In many communities, it was the most anticipated holiday of the year, and a chance for kinfolk and friends to come together. Today, families plan reunions, baptisms, and even their vacations around the day. Today, the decorations that continue at the North Shore cemeteries remain special pilgrimages for those with deep roots in the mountains.